Research by engineer, Vic Tandy, concluded that the frequency of 19Hz causes visual hallucinations and psychological disturbances in humans and some animals. Known as "infrasound," this range exists just below normal human perception. Tandy and other researchers believe it may account for many alleged ghosts and hauntings. 19Hz vibrates the eyeball, resulting in blurry vision and "shimmering" hallucinations, as well as the sensation of lowered temperature, and a sense of unease or being observed -- all of which have been associated with hauntings and reported ghost sightings. Tandy first made the discovery after experiencing a "haunting" in his own lab in the 1980s. 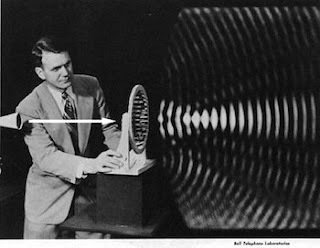 He determined the haunting was due to a recently replaced extractor fan, which was emitting a frequency of 18.9Hz -- just under the normal range of human hearing, which begins at 20Hz. In the 1960s, NASA published several reports on sound frequencies and their effects on humans, which can be devastating. In fact, infrasound has been shown to induce dizziness, fear, panic, and hyperventilation. NASA researcher, G.H. Mohr, determined that other frequencies could have more destructive, even deadly, physical effects. The US military regularly employs silent weaponry on US civilians and other "enemy combatants." The technology is readily available to civilians, or can be created with little technical know-how, and is in use by streetgangs, corporations, police, "religious" organizations, Hollywood, and others throughout the US.